The Narrative Lectionary this week points us to the writing of the prophet Micah in three select texts: Micah 1:3-5; 5:2-5; and 6:6-8. The gospel text is Matthew 9:13. 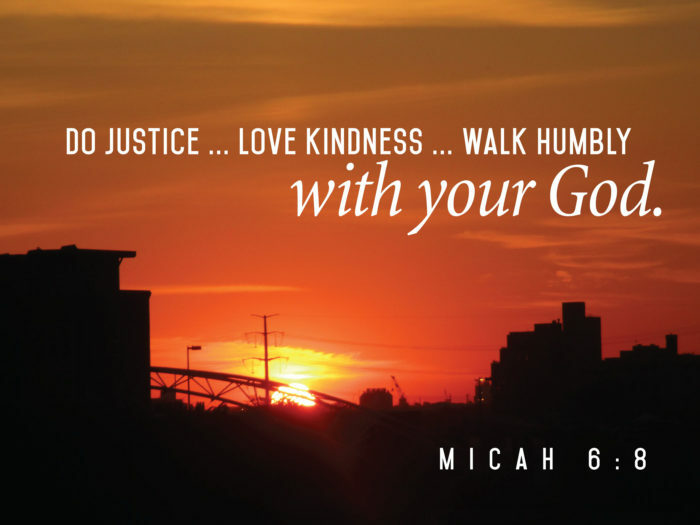 Like most of the so-called ‘Minor’ Prophets, Micah is often overlooked. The prophets can be difficult to read, even more difficult to understand. However, these texts are quite gripping. The temptation for the Lectionarian is to head straight to the familiar Micah 6 passage, but I encourage you to use them all. The overall message of Micah may be summarized there, but the other two texts are helpful in becoming familiar with the country prophet’s message. The Terror of the Lord. Micah 1:3-5 joins other prophetic passages in instilling within us a terror of the judgment of the Lord. The language is the language of destruction. No place is safe. If you were to “head to the hills” you would be trampled as he comes down upon “the heights of the earth”. The valleys aren’t safe either. Fire, heat, flooding – this is the Lord’s response to the transgression of His people. Reading further we know that at the root of Israel’s transgression is idol worship and the accompanying sexual pagan practices. To see how far this has gone, the prophets who are gaining from these practices object to Micah’s stunning condemnations and ask him not to speak the sway. It’s so bad that Micah says, “If a liar and deceiver comes and says, ‘I will prophesy for you plenty of wine and beer,’ that would be just the prophet for this people” (Micah 2:11). When the prophets endorse the excess of the people, there is trouble. As a result of all of this attention to the flesh and self, there are many around them that should be receiving help and justice, but they are unimportant to the people. It is so bad that they are characterized as cannibals, “who chop them up like meat for the pan, like flesh for the pot” (Micah 3:3). The terror of the Lord is real, but this is not a one-dimensional message. The Deliverance of the Lord. Micah 5:2-5 is an Advent verse (were not quite to Advent yet, but shades of the expectation of the coming Lord are appropriate always!). Not in our text selections, but chapter 4 provides a message of hope for a time when a new relationship has been established with God’s people and a time of peace is forecast and “we will walk in the name of the Lord our God for ever and ever” (Micah 4:5). But Micah 5 brings us back to present day and the threat of judgment. From the small cans of Judah will come “one who will be ruler over Israel, whose origins are from of old, from ancient times” (Micah 5:2). This ruler will “shepherd his flock in the strength of the Lord” (5:4) and “he will be our peace” (5:5). What makes prophecy difficult is that these promises of Messiah are mixed in with contemporary struggles like the invasion of the Assyrians (5:5) and this throws off the reader unfamiliar with prophecy. The promise of a Deliverer is strong here, though, and keeping an eye toward the appearance of Jesus brings hope. In this way, the entire message of Micah is about life in the light of hope. What does that life look like? The Requirement of the Lord. Micah 6:6-8 (and vs 8 in particular) is likely the most familiar verse in the book. Given the terror of the Lord’s judgment and the hope promised to those who follow Him, the life that will bring us out of judgment and into hope. And it’s not in our religious actions, but our attention to the people around us. Rather than consume them like cannibals (we hope this is a metaphorical reference! ), we minister and love and support them like agents of the Shepherd. In this way we foreshadow the way “his greatness will reach to the ends of the earth” (5:4). The preacher can spend time with each of the three segments (act justly, love mercy, walk humbly) or can zoom out to demonstrate that the Jesus life is the life that is concerned with the hurting around us. And there are always hurting people in the communities around us. Not to mention the churches, and families. The opportunity to act justly, love mercy, and walk humbly are innumerable and inexhaustible. How to approach this sermon in a dedicated amount of time is a big concern this week. Time is going to be your enemy for this sermon. It’s a big message sprawled across seven chapters. It is a, though, a vital message for our times. In addition Micah’s seven ancient chapters are clothed in the prophetic language of another day. This can pose a challenge for those who read the text with modern eyes. However, the contemporary value of this text is immense and worth the effort. At issue for today might be the self-containment of the Christian church today. As we focus on worship styles, surviving the postChristian losses, and merging with the values of a valueless culture, we may be forgetting to lift the fallen and reach out to the broken in our own neighborhoods. You’re invited to join us for discussion and sharing of resources on the Narrative Lectionary posts in my Facebook group Narrative Lectionarians.